Twix caramel cookie bars from M&M/Mars offer not just one caramel and cookie combo covered in milk chocolate – but two! As if the crisp and crunch cookie, rich milk chocolate and creamy caramel of one bar were not enough to savor, Twix went out on a limb to deliver seconds. Everyone knows Twix caramel bars, and everyone loves them! 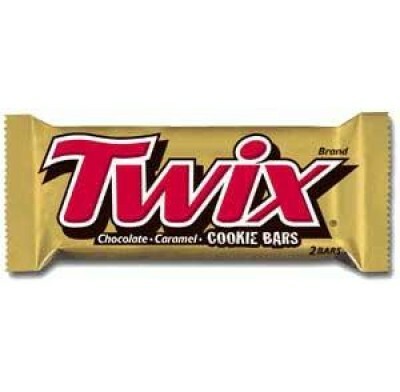 Twix bars are the original chocolate caramel cookie bar that always entices and never goes out of style. One of the most popular candy bars in the world, people enjoy the Twix caramel candy bar as an on-the-go snack that delivers a caramel, cookie and chocolate triple threat - twice over. 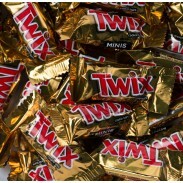 Order Twix candy bars from Sweet City Candy at our low wholesale prices. We now offer a 36-count box of individually wrapped candy bars to stock the shelves of your retail or candy store. Sweet City Candy is your wholesale candy headquarters. Enjoy Twix bars delivered fast, right to your door at low wholesale prices.